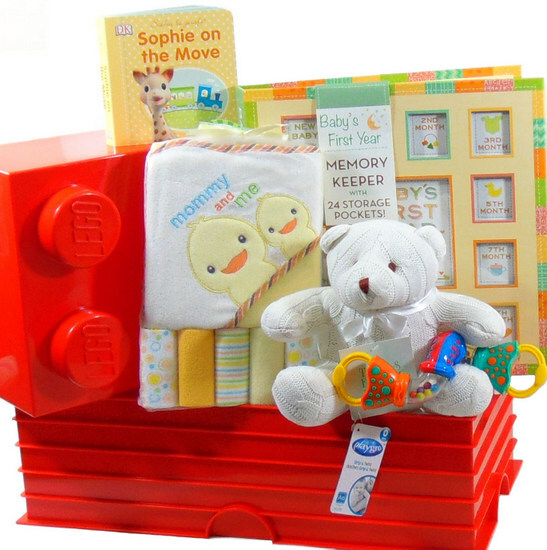 Lego Storage Brick Baby Gift Basket is a perfect addition to the new baby room or the room of an older brother or sister to store toys. Free Toronto hand delivery.One of our great selections of baby gift hampers baby gift baskets filled with newborn products to welcome new baby girl, baby boy to the world also great for baby shower gift basket. Baby Basket red Lego storage brick Baby Gift Basket. The perfect addition to the new baby room or the room of an older brother or sister to store toys. Free Toronto hand delivery. 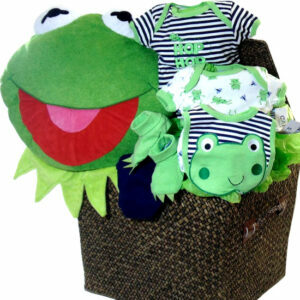 One of our great selections of baby gift hampers. Baby gift basket filled with newborn products to welcome new baby girl, baby boy to the world. Also great for baby shower gift basket. Baby basket red contains: Red Lego Brick storage container. Baby first year memory keeper. Tots Fifth Avenue 100% cotton knitted bear. Playgro grip & twist baby toy. Yellow embroidered hooded towel. 5 baby washcloths and Sophie La Girafe book.